Global Cooling Not Worth Shivering About But Is A Broken Ice Age Cycle Worth Sweating About? Valentina Zharkova of Northumbria University has suggested that a quiescent sun presages another Little Ice Age like that of 1300-1850. I’m not persuaded. Actually, Zharkova thinks some cooling similar to that which occurred during the Maunder Minimum (1645-1715) may occur in the near future (2030 onwards) because of a possible approaching solar activity Grand Minimum, predicted by her mathematical model of solar magnetic fields. I am persuaded. The degree of cooling will be dependent on how right (or wrong) predictions of global warming based upon GCMs are. Currently, they’re not doing that well, having failed to anticipate the Pause, now only looking reasonable because of a ‘spurt’ in global warming caused by El Nino and a hitherto unexplained reluctance of the planet to cool significantly in 2017 (with a few very notable regional exceptions), despite a weak La Nina. But it has cooled of course, enough to leave the warming trend since 1979 in UAH satellite data unchanged at 0.13C/decade, which is significantly short of what climate models predicted for the lower troposphere. 2017 was the third warmest year since 1979, behind 2016 and 1998. So one year after the super El Nino year of 2016, it’s warm, but not as warm as it was in the previous super El Nino year of 1998, now 20 years ago. Hence no sign of runaway global warming, no sign of imminent cooling either. Boring. But I’m not going to rattle on about a possible ‘Little Ice Age’ and what that might mean for the economy and food production and the poor sods who can’t afford to heat their homes even now courtesy of renewables zealots; I’d like to talk about proper Ice Ages (more correctly, glacials), which is what Matt Ridley talks about mainly, in The Times. As Paul points out on Twitter, first they are “absolutely sure” that anthropogenic GHGs have ‘broken’ the sawtooth-like cycle of Pleistocene glacials and interglacials and that this “finding” is “profound”, then they say GHGs “could” delay the inception of the next glacial way beyond when it is expected. Not exactly a shining example of temperance and even-handed scientific logic from two leading supposed experts in their field; in fact somewhat spiteful and evidently a carelessly and hastily thrown together dismissal of a person whose opinion and writings in general they probably have little respect for, being obvious members of the Konsensus. Pre-industrial land use may have caused CO2 to be elevated, in which case not being well on the way now to a full glaciation is our fault. The Holocene, even without additional CO2 released by fossil fuels, will probably last another 50,000 years. Because of the burning of fossil fuels, the end of the Holocene is now delayed for an extra 50,000 years, meaning it won’t end for at least another 100k years. So not only have we broken the cycle of approximate 100,000 year glaciations, followed by brief (tens of thousands of years) interglacials, but we’ve effectively terminated the Pleistocene Ice Age which started 2.6 million years ago – although purists will say that the Pleistocene Epoch ended 11,700 years ago, when the Holocene began. In honour of our “profound” geological impact over just 200 years, the Holocene has also ended in the minds of some and the Anthropocene has already begun, an epoch during which the poles will likely melt altogether, sea level will rise hundreds of meters and the Earth will be burned to a crisp by an unstoppable enhanced Greenhouse Effect. It could have been so different. We could have been joyfully watching the advance of mile high ice sheets by now, covering much of North America and Europe, and celebrating the receding coastlines as sea-level dropped. No more Sandys and Harveys devastating vulnerable coastal cities, which would now be miles inland. Alas, ’twas not to be. I don’t know about you however, but the prospect of another 100,000 years of warmth and high CO2 doesn’t sound all that bad when compared to the alternative. Over such an enormous span, humanity would inevitably adapt, as indeed it would during a major glaciation, but I know which I would prefer. So does civilisation – it was unknown until the advent of the warm Holocene interglacial. That [Holocene] interglacial will end. Today the northern summer sunshine is again slightly weaker than the southern. In a few tens of thousands of years, our descendants will probably be struggling with volatile weather, dust storms and air that cannot support many crops. Game, set and match to Milankovich? Not quite. 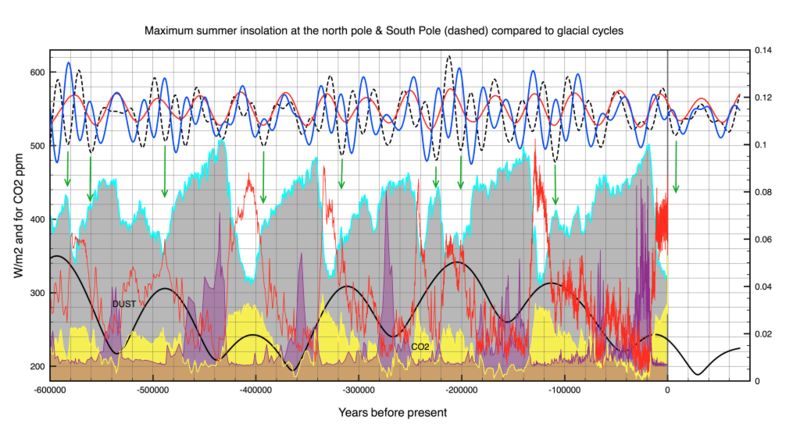 The Antarctic ice cores, going back 800,000 years, then revealed that there were some great summers when the Milankovich wobbles should have produced an interglacial warming, but did not. To explain these “missing interglacials”, a recent paper in Geoscience Frontiers by Ralph Ellis and Michael Palmer argues we need carbon dioxide back on the stage, not as a greenhouse gas but as plant food. The argument goes like this. Colder oceans evaporate less moisture and rainfall decreases. At the depth of the last ice age, Africa suffered long mega-droughts; only small pockets of rainforest remained. Crucially, the longer an ice age lasts, the more carbon dioxide is dissolved in the cold oceans. When the level of carbon dioxide in the atmosphere drops below 200 parts per million (0.02 per cent), plants struggle to grow at all, especially at high altitudes. Deserts expand. Dust storms grow more frequent and larger. In the Antarctic ice cores, dust increased markedly whenever carbon dioxide levels got below 200 parts per million (0.02 per cent), plants struggle to grow at all, especially at high altitudes. Deserts expand. Dust storms grow more frequent and larger. In the Antarctic ice cores, dust increased markedly whenever carbon dioxide levels got below 200 ppm. The dust would have begun to accumulate on the ice caps, especially those of Eurasia and North America, which were close to deserts. Next time a Milankovich great summer came along, and the ice caps began to melt, the ice would have grown dirtier and dirtier, years of deposited dust coming together as the ice shrank. The darker ice would have absorbed more heat from the sun and a runaway process of collapsing ice caps would have begun. If that’s Shuckburgh and Wolff communicating science succinctly, then Mohammed was a born again Christian caught in a time warp. Who are the APPCCG I hear you ask? The All-Party Parliamentary Climate Change Group. Chaired by Caroline Lucas. Enough said. Emily Shuckburgh proudly retweeted the tweet above, no doubt very pleased with herself for countering climate fiend Ridley’s attempt to misinform the world about ice ages and global cooling. In a second post, we’ll examine the competing theories on what really causes glacial periods to come and go in regular fashion and we’ll see just how ‘certain’ it is that they’ve gone the way of the dinosaurs – well, at least for the next 100,000 years anyway. We’ll also look at when we can realistically expect the Holocene to end, assuming CO2 is not the dreaded Thermageddon Molecule. Tags: glaciation, Ice Ages, Milankovich cycles, science. Bookmark the permalink. Anyone predicting with certainty 100k years out is full of crap. In this case crap covered with a veneer of sciencey faux outrage. A little known fact that supports the interpretation that deserts expanded significantly during glacials is the presence of Pleistocene sand dune complexes beneath much of the African equatorial forests. I was once approached to do some research on them, but the money never was forthcoming. The central Australian deserts are plastered with seif dunes and in the Eastern States there are many deposits of parna (Australian parlance for loess) from the last glacial maximum. The dunes were active then and are stabilised by vegetation now. The parna is vegetated. The LGM was much drier than current conditions. There is no doubt whatsoever that scientists in the early 1970s were widely predicting a return to glacial conditions – within decades in many cases. The press went mad on the idea. The frenzy only subsided towards the end of the decade when the global warming scare started to gain traction. The rest, as they say, is history. Nobody can possibly know for sure when the next glacial will begin (or that it won’t begin), but what is fairly certain is that Earth has been cooling since the Holocene Climatic Optimum and, barring a Hockey-stick like return to sustained global warming due to GHGs, we probably won’t see that kind of warmth again. Didn’t the last ice age really end about 15000 years ago, only to be interrupted by the Younger Dryas? Ok, that still gives us 5000 years if we’re in a double interglacial but why should there be a set length when eyeballing the last 800,000 years, there is no set pattern? I look forward to part 2.
b) We CAN model climate over the next hundred years because the small variations are unimportant to the trend. c) We can’t model the last 1000 years even though it is a long term trend because we haven’t got the starting conditions (except we have but we don’t like to talk about that). d) We can’t model the last 400,000 years for reasons see c) but we’re sure that this interglacial should have ended by now and only CO2 is holding it up. Tiny, the Holocene began in earnest about 12,000 years ago. I guess that’s when we can say the last ice age finally ended, but as you say, it started to terminate thousands of years before that, transitioning to a highly unstable phase of intermittent rapid warming and cooling, which included the Younger Dryas. It seems likely that these rapid northern hemisphere climate changes were driven by successive periods of melting of the ice sheets, which dumped huge quantities of freshwater into the North Atlantic, which in turn interrupted the thermohaline circulation, drastically reducing northward heat transport, temporarily halting the thaw. All other things being equal the next Ice Age should begin within the next 5000 years and Ice sheets will cover much of North America and Europe within 20,000 years. It is nonsense that we missed a glacial inception just before the industrial revolution because CO2 levels were above 240 ppm. The Eemian interglacial ended despite CO2 level at 280 ppm and they then remained above 240ppm for the next 35 thousand years ! They’re also ignoring the fact that CO2 won’t remain in the atmosphere forever unless it’s maintained. We’d be in trouble if we haven’t come up with a new energy source in a 1000 years, let alone 5000. They calculate if we emit 1000GT carbon into the atmosphere over the next few hundred years, CO2 levels won’t decay back to below 300ppm for 100,000 years. Sounds implausible to me. That’s because they use the Bern model which assumes that 19% of anthropogenic emissions ( but not those from volcanoes ) remains in the atmosphere for ever (100,000y). If on the other hand you assume oceans take up the excess by equalising partial pressures then a doubling of CO2 falls below 300ppm after 125 years. If on the other hand you assume oceans take up the excess by equalising partial pressures then a doubling of CO2 falls below 300ppm after 125 years. Except, this will almost certainly not be the case, as we’ve discussed before. One unaddressed assumption in this alarmist claptrap is the idea that CO2 sticks around for 100,000. And note that in the magic belief systems of alarmists is the equally preposterous idea that there us a chemical difference between anthropo CO2 and naturally emitted. And if course cue in ATTP the intellectual coward who offers circular reasoning and blue smoke to explain the magic of anthro CO2. Clive, Can you explain the chart a little you posted earlier? What is the black smooth curve? So in the worst case after 50,000 years we have CO2 levels = 280+ (0.08)*280 = 302 ppm CO2 forcing is 0.4 W/m2. The drop in summer insolation over the Arctic between now and the next obliquity enhanced minimum is 22W/m2 . That is over 50 times larger. Furthermore during the Eemian and the Anglian glaciations began with CO2 levels > 280ppm. The black curve is the eccentricity of the earth’s orbit which acts as a pacemaker for glacial cycles. All interglacials for the last 800,000 years begin when eccentricity reaches a maximum. This is still not completely understood, but eccentricity acts like an amplifier of the seasons. The seasons precess with the earths wobble about its spin axis – like a gyroscope. One complete wobble takes about 21,000 years. As far as I can tell, the Bern Model is exactly that – a model. Not properly tested or verified such that it can be reliably applied to calculating the residence time of anthropogenic CO2 – certainly not 50k-100k years into the future. Actual direct measurements of the lifetime of CO2 in the actual atmosphere give a residence time of approximately 5 years which means that emissions would be recycled by fast sinks pretty quickly, but somehow we have to believe that this very fast turnover is unrelated to the actual accumulation of CO2 in the atmosphere and unrelated even to the residence time of anthropogenic CO2 long after emissions cease, because the natural system is in such fine balance. Too many presumptions and mental contortions for me; not enough hard evidence to verify this rather odd theory of the carbon cycle. The tells that the 100k number is alarmist arm waving are multi-pronged. So who actually devised the Bern Model? The gnomes of Zurich? Or maybe 97% of the Gnomes of Zurich? JAIME JESSOP 11 Jan 18 at 6:53 pm: I think you are confusing the biosphere mixing time of 5 years with the e-folding diffusion time of 40 years. The complete atmosphere CO2 is refreshed in 5 years, but that doesn’t mean that a CO2pulse in the atmosphere of a given concentration is decaying in 5 years, that takes approximately 40 years. What does it take to raise the atmospheric co2 equilibrium level to cretaceous values? In my opinion onty a significant heating of the ocean bottom from 4 degC to 25 degC, coinciding with a benthic mass extinction. This temperature rise raises the carbonate compensation depth significantly and releases the dissolved co2 to the atmosphere. The current released fossil CO2 is nicely absorbed with an e-folding time of 40 years whithout any sign of the dreaded sink saturation that the Bern model predicts. The Bern model is falsified by the atmospheric co2 level, just like the polar bear extinction model of Amstrup is falsified by the risen polar bear population. Quite likely Hans – I find the whole subject somewhat bewildering I must admit, but I’m not so bewildered as to be completely oblivious to the fact that the consensus explanation for anthropogenic CO2 accumulation and its extraordinary longevity smells a bit rum. Viewing the current Holocene interglacial on a millennial basis is sensible. But it seems that, driven by the need to continually support the Catastrophic Anthropogenic Global Warming thesis / religion Climate alarmists irrationally examine the temperature record at too fine a scale, weather event by weather event, month by month, or year by year. However from the broader perspective, each of the notable high points in the current 11,000 year Holocene temperature record, (Holocene Climate Optimum – Minoan – Roman – Medieval – Modern), have been progressively colder than the previous high point. The ice core record from Greenland for its first 7-8000 years, the early Holocene, shows, virtually flat temperatures, an average drop of only ~0.007 °C per millennium, including its early high point known as the “climate optimum”. But the more recent Holocene, since a “tipping point” at around 1000BC, 3000 years ago, has seen temperature fall at about 20 times that earlier rate at about 0.14 °C per millennium . Nonetheless, the slight and beneficial warming at the end of the 20th century to a Modern high point has been transmuted by Climate alarmists into the “Great Man-made Global Warming Alarm”. As a layman, I would say that the betting is more heavily weighted towards a catastrophically cooling world rather than one that will be overheating because of the comparatively minor CO2 emissions from mankind. You cover a lot of topics on this blog post and most of them make a lot of sense. Climate cycles, Earth Changes, and “Ice Ages” would be much better understood if there wasn’t a concerted effort to hide the truth: there is a periodic cycle of solar outbursts causing pole shifts on Earth approximately every 12-13,000 years. “Ice Ages” happen when a region is located near one of the poles, like Hudson Bay was prior to 13,000 years ago, or like Antarctica is today. David, thanks, I’d forgotten about this post. Never did get around to writing the second installment. The latest theory is that Ice Ages are caused by tectonic activity in the tropics which ‘pulls out’ CO2 from the atmosphere, enough to cool the planet by several degrees. Oh well . . . . .
Jaime. Thank you for the opportunity to comment upon the study linking tropical weathering of ophiolites to ice ages. I had thought to comment over at WUWT but that discussion rapidly became stupid with a commentary that devolved into short statements of opposition (without reasons being offered) or really wacky science. I chose not to be drowned out in that mix. The paper, which I had only read a detailed report upon from MIT is, as far as I can tell an absolute disaster, compiled as far as I can tell to jump on the CO2 bandwagon. But its basic geology is absolute rubbish. Ophiolites are believed to be bits of the oceanic crust and the uppermost part of the mantle. They consist largely of basaltic pillow lavas and feeder intrusions (dykes), in some instances underlain by gabbros and at the base ultramafic peridotites (= the upper mantle). We do not understand how such dense rocks can be emplaced onto much lighter continental crust, but it involves plate collision and mountain building. The new paper’s thesis is that when plate sutures are formed in the tropics this exposes vast amounts of ophiolites to tropical style weathering which draws down vast amounts of atmospheric CO2 to create limestones. This alters climate sufficiently to cause ice ages. I will only comment upon the geological aspects. 1. Ophiolites are uncommon, occurring as geological slivers or fragments. After plate collision, only tiny parts of the geological sutures are composed of ophiolites. Ophiolites are rare. 2. Most ophiolite complexes are composed of basic igneous rocks (basaltic pillow lavas, dolerites, and gabbros), with ultramafic rocks constituting only a small part. Their weathering differs very little from that of flood basalts, many more of which erupted in tropical settings without affecting climates so as to cause ice ages. The basic cause is rubbish. 3. Most ophiolites occur in mountainous terrains, therefore even if emplaced within the tropics would have weathered in alpine climates. The proposed mechanism is rubbish. There are so many bits of geologic illogic in the paper, that I really do wonder at the standard of peer review- didn’t a competent geologist review it. It is appalling, one of the authors even works within spitting distance of the San Francisco ophiolite. Alan, thanks for that. We can always rely upon your good self for an erudite response on these topics. My only impression is that it seemed a bit far-fetched and grasped at the simplistic (and very likely wrong) notion that atmospheric CO2 (or lack of) is absolutely crucial for the transition to occur to an ice age climate. Likewise, that CO2 above 265-280ppm will delay the inception of a glacial interlude indefinitely.